Twice a year in the city of Igualada, around 50km west of Barcelona, an old industrial district is turned into a fashionista’s dream. Former warehouses become filled with pop-up shops selling top brands at special prices. And it’s that time again. The Rec.017 festival is underway once more, with a total of 56 industrial spaces where shoppers can find over a hundred well-known labels as well as some emerging designers. But it’s not all about clothes. At the bi-annual festival, culture, gastronomy, and heritage are all interwoven into the four day event. 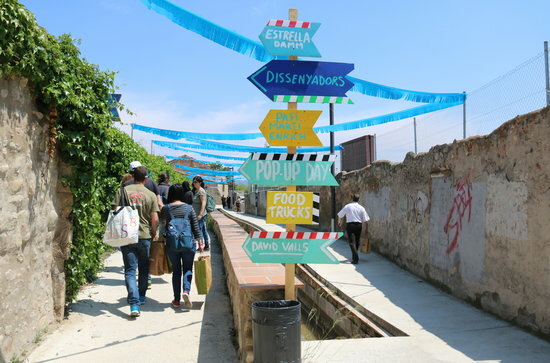 Alongside food trucks, visitors will also be able to enjoy the odd free concert in the Rec neighbourhood of Igualada, which was once a hub of industrious activity. Around 120,000 people come to the event every edition. Among the major brands that can be found at Rec.017 are the staple classics such as Reebok, Adidas, Levi’s, Mango, and Camper. Some lesser-known emerging labels will also be showcasing their wares. These include names like Morsa Fang, Nona BCN, Woodys Barcelona, and Maria Roch. They may not be as famous as the big names yet, but keep your eyes peeled. They could be coming to a store near you soon. A day of shopping can certainly get the stomach rumbling. But at Rec.017, there are enough food options to keep hunger at bay. The ‘Rec Street Food’ section features 34 food trucks as well as a pop-up bar. For the ecologically conscious, much of the wide variety of culinary delights available is sourced locally. Rec.0 was set up back in 2009 by a group of six people who wanted to showcase the Rec district of the city, combining it with fashion and creativity. It was once home to factories and tanneries. The event runs until May 13, but for those who cannot make it this time round, the next Rec will be held from the 9th to the 12th of November, between 10am and 10pm.